This weekend there will be some company in Halifax Harbour as the Tall Ships are set to arrive. The ships will return to Halifax for the first time since 2009, this year as part of Rendez-Vous 2017. Tall Ships and Halifax has become a tradition since their visit in 2000. Each of their visits acts as a homage to Nova Scotia’s relationship with the ocean and the role the province played in the Golden Age of Ships. For the past five months, these ships have been participating in a 7000 nautical mile race spanning five countries. Starting in the United Kingdom, they have passed through Portugal, Bermuda, and the United States. Over the past two months, they have visited Prince Edward Island, Ontario, and Quebec. As they begin the final leg of their race, they will spend the weekend in Halifax entertaining over 250,000 visitors. Starting Friday the 28th and running until the following Tuesday, Nova Scotian’s will welcome over 40 tall ships from 10 different countries. Along with live music and entertainment, visitors will be able to tour the ships for free. There will be nightly fireworks and a Parade of Sail which will take place on Tuesday at 12 pm. 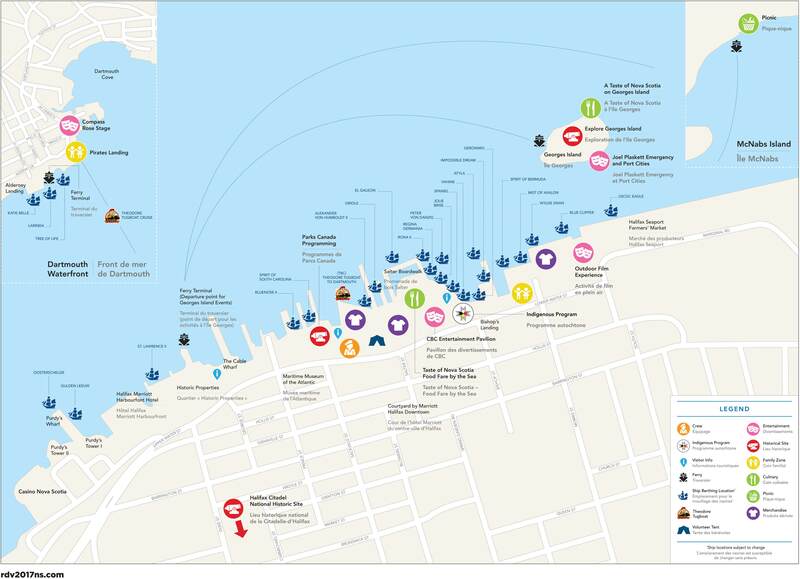 Parking downtown will be tricky during Rendez-Vous 2017 Tall Ships Regatta. The ongoing music performances on the waterfront will occupy the public and private parking lots. In order visitors to get downtown, a free shuttle will be running from Citadel Hill to the Maritime Museum of The Atlantic on Saturday, Sunday, and Monday. As well, a trolley will offer rides along the waterfront starting at The Westin Nova Scotian. Visitors will have free access to each Tall Ship starting Saturday and go through Monday from 11 am to 4 pm. This includes ships on the Halifax side and the Dartmouth side. Photo ID is required. The CBC Main Stage, located in the Salter Street Lot, features free music and entertainment. Some of the artists include Natalie MacMaster, Symphony Nova Scotia, The Mellotones, and Reeny Smith. Joel Plaskett and Port Cities play a show on Mcnabs Island starting at 11 am on Saturday. Tickets are $30 and are available for purchase here. There will be fireworks on Saturday, Sunday, and Monday over the harbour. There will be family programming at Alderney Landing involving pirates, shipbuilding, and mermaids.